Jennifer Phillips has read 8 of 30 books. Jennifer Phillips read 56 books of her goal of 10! Jennifer Phillips read 24 books of her goal of 24! Jennifer Phillips is a member of a number of organisations including the Gold Coast Writers Association and the Australian Federation of Graduate Women. 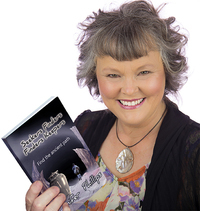 She is a teacher and author of 9 books to date covering a range of subjects and genres. She was awarded the title of Massey Scholar and has won awards in other fields as well, including academic writing and is known for her unique forms of poetry. Her writings inspire faith in her readers and come as a result of her own rich and deep personal journey in faith which has opened the door for her to speak to and teach all ages. To ask Jennifer Kathleen Phillips questions, please sign up. Jennifer Kathleen Phillips I am currently working on a series called Seekers Finders Finders Keepers. "Find the ancient path" has just been published. "The Hiding Song" and "The…moreI am currently working on a series called Seekers Finders Finders Keepers. "Find the ancient path" has just been published. "The Hiding Song" and "The Finding Song" are both at the editing stage. The paperback version of my novel "Find The Ancient Path," is now available. It's suitable for ages 13 and up. We’d love your help. Let us know what’s wrong with this preview of Buying Love by Toni Shiloh. We’d love your help. Let us know what’s wrong with this preview of The Amazing Story of the Man Who Cycled from India to Europe for Love by Per J. Andersson. We’d love your help. Let us know what’s wrong with this preview of Translating God by Shawn Bolz. We’d love your help. Let us know what’s wrong with this preview of Realms of the Kingdom by Revelation Partners.